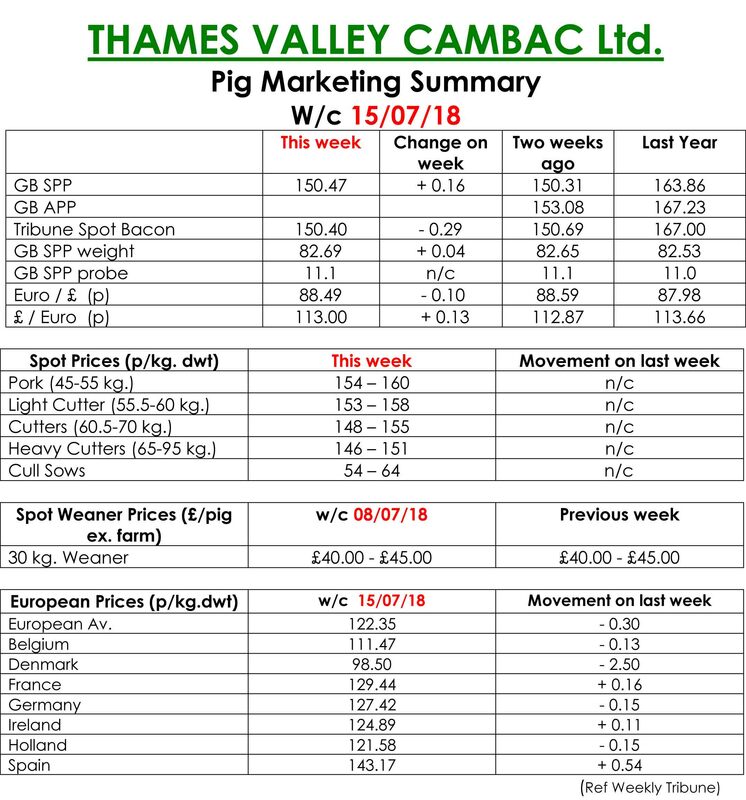 This week’s Slaughter Pig Marketing Summary from Thames Valley Cambac suggested the market maintains its lacklustre feel. Pig numbers available for market are below what’s expected but this still doesn’t create demand for pigs as some processors are extremely relaxed about being short of their contracted numbers. Processors that operate a pricing methodology with an element of their own input reduced this element between 1p & 2p which reduced “Q” prices by about 0.5p This is against a slight increase of 0.16p in the SPP to 150.47p. However, the Tribune reflected more of the market sentiment with a 0.29p decline to 150.40p again mirroring the EU drop of 0.30p to 122.35p. This 28p gap is also part of the reason the UK demand for pigs is somewhat depressed, as imported product is that much cheaper. Spain was the only market in Europe that saw any increase, but was minimal and very much down to seasonality whilst the Danes depressingly dropped below 100p per kg for the first time since May 2016. 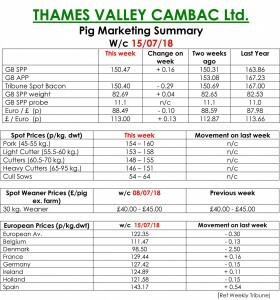 The sow market basically stood on as did the exchange rate but this was against the background of reports that a few more sows across Europe were coming forward which is hardly surprising given the returns they have been and are facing. Feed prices are currently well above average although the cereal market did experienced some relief through this last week and as the combines start to move this might offer some buying opportunities in the short term. The Weaner Marketing Summary, for week commencing July 8, said the gap continues to widen between contacted weaners/stores and the weekly market. Spot buyers are very few and far between and those that have space will only purchase if it’s to go against future contracted sales.